The ruins at Hampi conjure images of an era gone by, of mighty dynasties who once ruled . Such are the vagaries of time. But the splendour of the structures remaining speak volumes of the past and the depict richness of Indian architecture which capture both the ordinary and the cosmic. In Hampi, Hospet in Karnataka’s Bellary district in present day Karnataka, there is a belief that this is the place of Kishkinda of Ramayana. Archaeologically speaking, Bellary district has some rock edicts of King Ashoka. Buddhism was prevalent in the region in the first and second centuries A.D. The area has been ruled by Chalukyas of Badami, Rashtrakutas Chalukyas of Kalyani, the Hoysalas and the Yadavas. Hampi, however conjures up images of the power and resplendence of the Vijayanagara kings. This empire came to glory after repeated Islamic invasions on South India. Harihara and Bukka from the Sangama dynasty founded the city of Vijayanagara with Hampi as the capital. Other dynasties too ruled over Vijayanagara empire; Saluva,Tulava, and Arivedu. Praudha Deva Raya(1420 – 60 A.D.) Krishnadevaraya(1509 – 1529) and Achyutaraya (1530 – 42 A.D.) are the well known rulers. The monuments, and shrines in Hampi include the Sasiva Kalu Ganesa, Vishnupada shrine, Kadale kalu Ganesa, temples on Hemakuta Hill, Virupaksha temple, manmatha Honda, Eduru Basavanna, Achyutaraya temple, Matanga Parvata, Kodandarama temple, Varaha temple, Siteya saragu, Sugriva’s cave, Kotilinga, Kampabhupa Marga, Hastagiri Ranganatha temple, Vishnu temple, Narasimha temple, Two storied mandapa and King’s balance, Purandara mandapa, and Vishnu temple. The building material used is the granite which abounds in the region. For domed structures and royal buildings stone rubble in mortar was used. The most important temple in Hampi is the Vitthala temple dedicated to Vishnu. Other structures include Vitthala Bazaar and Loka Pavani, Kudure Gombe Mandapa, Gejjala Mandapa, siva temple, sri Naraharitirtha Brindavana, talavaraghatta gate, Prasanna narasimha temple, Krishna temple, Narasimha shrine, Badavi Linga uddana, Virabhadra, Chandikeswara temple, Lotus mahal, ruins of zenana enclosure, palace of Vira Harihara, Elephant’s stable, Guard’s house, Parswanatha temple, Ranga temple, Shringarada Habbagilu, Hazaara Ramachandra temple, Saraswati temple,Queen’s bath and many more…! The most splendorous temple at Hampi is the Vitthala temple. Vitthala is a form of Lord Vishnu worshipped in Karnataka and Maharashtra. Vishnu has ten incarnations and sculptural representations are seen carved on various pillars of the temple. It is a huge temple complex and has entrance gateways on three sides. In the middle of the courtyard complex lies the main shrine. This was built before the sixteenth century. Devaraya II ( 1422-46 A. D.) most probably started the temple. Krishnadevaraya added many structures to it. The east facing temple has garbagriha,antarala,pradakshinapatha,sabhamandapa, mahamandapa, kalyanamandapa, and devi shrine for Rukmini, consort of Vitthala.The Vahana mandapa is the in the form of a chariot dedicated to Garuda, the vehicle of Lord Vishnu.The garbagriha and sabhamandapa are square shaped. The sabhamandapa stands on four central pillars which is set on a raised floor. The mahamandapa stands on 56 pillars.sculpted out of the granite stone elevated on an ornate base decorated with friezes which include horses horses with attendants and smaller shrines with ten incarnations of Vishnu. The ceiling is decorated with lotus and other motifs. The mahamandapa is supposedly having musical pillars. Pillars supporting the roof is supported by a pillar representing a musical instrument and is constructed as seven minor pillars around a main pillar. Thirty inscriptions have been found in the complex. The gopurams were donated by Chinna devi and Tirumala devi, queens of Krishnadevaraya who built the hundred pillar hall in 1516. The Kalyanamandapa is an open mandapa standing on 48 pillars having three entrances, towards the southern side of the complex. The pillars depict the Dasavataras, Garuda, Hanuman, dancers and saints. The Uyalamandapa having two entrances is on the southern side which stands on 44 pillars. At the northern end sixteen pillars are raised and a wall has been constructed. At north west side the devi shrine, dedicated to the consort of Vitthala is found which has a garbagriha, antarala, sabhamandapa and mukhamandapa. the sabhamandapa has a garbagriha attached to it. The pillars of sabhamandapa has deities on it. the mukhamandapa stands on 16 pillars which have deities on them. The Vahana mandapa consists of a chariot- temple dedicated to Garuda, vehicle of Lord Vishnu. this is called vitthala ratha temple. It is believed that the world will end the day the chariot is moved from its place. The ratha is built in Dravidian style of architecture, on a rectangular base decorated with mythical scenes. 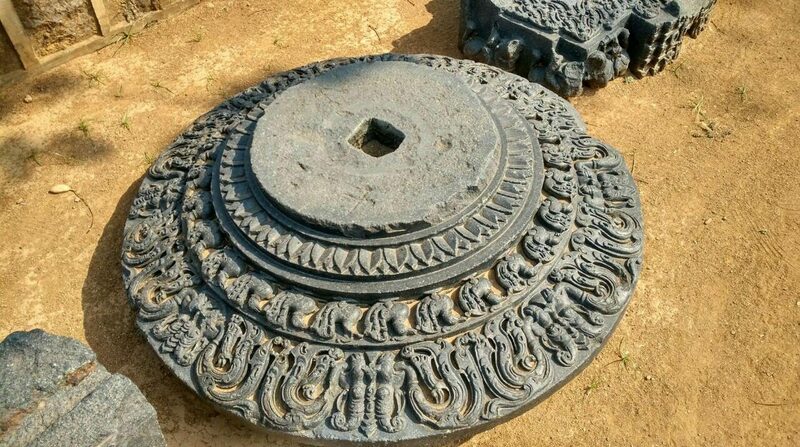 the ratha has four heavy granite decorative stone wheels attached to it movable on axis shafts. in front the chariot has two elephants giving one the impression that they are pulling the chariot. it is believed that originally there were horses in the place of elephants. Between the elephants there is a ladder leading to the shrine. On the southwest side a one hundred pillared hall, Nooru Kamba mandapa made by Krishnadevaraya with entrance towards east, is present. Southwest to the Vitthala temple is the Tulapurushandana(King’s Balance) made up of two carved granite pillars with a granite lintel in between which has a stone loop in the centre. Scales were hung on special days and the Raya/king was weighed against gold or precious stones, which were given away in charity. This entry was posted in art history of India, Hampi, history of india, pillars, sculpture of india, Vijayanagara and tagged art history, Hampi, sculpture on May 31, 2016 by historyreads. Durga is a revered Goddess and worshipped all over India. She is a form of Shakti, one of her forms is mahisasuramardini. Durga has been depicted in India in sculpture , miniature paintings, wood carvings , puja idols and metalware. Durga slaying the Mahishasura is a prominent theme which was sculpted in various caves and temples across India. Mahisasuramardini is one of the various forms of Durga or Shakti which indicates activity and capacity. all activity emanates from adya shakti(primordial energy), manifestations of the universal energy. The Indus valley civilisation has unearthed number of female figures in terracotta representing Mother Goddess. In the Vedas too number of goddesses are mentioned in different capacities. The Mahisasuramardini is one of the manifestations of the Divine mother whose [primary aim is to combat demons who threaten the cosmos. she has many arms and each has a different weapon. She rides on a lion and defeats the buffalo demon Mahisasura who has been given a boon that no-one can defeat him except a woman. He defeated all gods in battle. the Gods got together and put all their energy which got transformed into a beautiful, strong woman. This legend is found in various texts like Devi Bhagvata purana, Varaha purana, Vamana purana. the legend varies in different texts In Devi Bhagavata Purana the Gods headed by Brahma and Shiva approached Vishnu after being defeated by Mahisasura. Out of the energies of Vishnu, Brahma and all other Gods a female deity was created who was given weapons from all of them to use in battle against Mahisasura. Images of Mahisasuramardini vary across the country in the number of arms and the way in which the demon is being killed. The ten armed devi has a trident, a sword,a chakra,a saktyayudha, an arrow, a bow, a trisula, a vajra, an ankusa and a bell. When she engaged in battle she had absorbed the energy of the Gods and they witnessed the mighty cosmic battle in awe.The sculptors across India have referred various texts and sculpted various forms of the Goddess. Some images appear in different forms; one in which the buffalo is seen on the knee of the Goddess, some in which it is lifted up by the left hand with the tail/hind leg and the right hand pierces the snout with a trisula; in some the buffalo is held by snout and or caught by a noose. In some images the devi is standing on the severed head of the buffalo and the Goddess has four arms with discus,conch, abhaya and katihasta. Sometimes a trisula replaces the abhayahasta. Sometimes two devotees and seen on either side of the six arms and lion is present. Some images have eight arms . Sometimes demon is a combination of man’s body and buffalo head and caught with noose or caught by horn, in kneeling in front of the Goddess or fighting with her. Sometimes demon is seen emerging from the severed neck of the buffalo or the Goddess is pressing on the chest of the demon. Images are found in Mathura,Orissa,Bhita, Bhumara in Madhya Pradesh, Ellora, Alampur, Chidambaram. Other main representations are seen at Mahabalipuram, Ellora, Hoysaleswara,Halebid and Udaigiri . Mahabalipuram, 7/8th century, Tamil Nadu. In the relief the Goddess is an a lion,eight armed, shooting arrows at the demon. Her other hands hold a disk, bell, sword, conch, noose etc. The ganas of Shiva surround her holding weapons. This image is from a town in Tamil Nadu’s Kancheepuram district, a port city during the rule of the south Indian dynasty of the Pallavas. There are groups of sanctuaries carved out of rock in the 7th and 8th centuries which are excellent examples of Pallava art including rathas(temple carts), mandapas,rock reliefs. The relief mentioned here is of mahisasuramardinini . Hoysala architecture in Chennakesava temple at Belur in Karnataka has a stunning sculpture depiction (1268); the image of the Goddess is a symbol of energy and full of metaphysical meaning. The right leg of the Goddess is on the buffalo and the trident or trisula on the demon’s chest. An attendant is seen below near her feet. The Hoysala temple here stands on a stellate platform. The Hoysala empire existed between the 11th and 14th centuries in present day Karnataka.The famous temples are the Chennakesava, Ishvara, Someswara,Kesava among others. Ellora cave temples have a depiction of the devi in Cave 21 which is known as Rameswara and is from the 8th century B.C. She is seen standing in alidhasana and with her right foot on a buffalo and seen wearing a jatamukuta, armlets,bangles,and a girdle on her waist. She is chaturbhuja ie. having four hands and holds a sword, trisula,shield and a buffalo head. There are two male attendants on either side with the weapons sword, shield and mace. Ellora is located 28 km form Aurangabad in the present day Maharashtra. The caves were carved out of the Charanandri Hills between 5th and 10th centuries by the Rashtrakuta and Yadava dynasties. Out of the 34 caves 17 are Hindu, 12 Buddhist and 5 Jaina Caves. Ellora cave, 8th century, Maharashtra. Mahisasuramardini by Sanjaya Kumar Mahapatra, Agam Kala Prakashan, 2014. Goddess Durga : the power and the glory, Marg Publications, Mumbai,2009. In praise of Hoysala art, Marg, Vol XXXI, No 1, Mumbai. This entry was posted in Uncategorized on May 30, 2016 by historyreads. The Konark Sun temple in the form of a ratha or chariot is situated in Orissa. It is a remote site on a sandy beach near the month of the Chandrabagha river, dreid up tributary of the Prachi. The worship of the sun is ancient and is represented as a dark-red man with three eyes and four arms, riding a chariot drawn by seven horses, each representing a day of the week. Arun (the dawn) , brother of Garuda is his charioteer. The temple architecture is a variation of the nagara style of the Hindu temple. The temple “Surya Deul” was built by a king of the Ganga dynasty King Narsimha I. The word Konarka means the arka of kona(corner) variously interpreted as ‘sun in the south eastern corner of the earth or the corner of Orissa dedicated to Sun. The Mahagayatri temple, also called Mayadevi temple was constructed along with the Surya deul in the mid-thirteenth century for the Consort of Surya.Some evidence however states it might have been built earlier. There are three images of the Sun God at three different sides of the temple,placed in such a way to catch the sun’s rays at morning, noon and evening. The Surya deul complex is in a compound with gateways on the east and south. The walls are made of khondalite. The remains of the Surya deul are present on the east west axis and consists of the deul, the jagamohana and nata-mandira in front. The Mayadevi temple is at the southwest of the remains of the deul. Behind this is the brick Vishnu temple. The stones used for construction was laterite, khondalite and chlorite brought from Naraj. The deul and jagamohana is in the form of a chariot (ratha) on a platfrom and pulled by seven horses. There are 24 wheels, 12 each on north and south sides which are carved on the walls. These wheels probably correspond to the twelve signs of the Zodiac. Each wheel is 9 feet 9 inches in height and has 16 spokes, 8 of which are thick and 8 are thin. The entire wheel is richly carved. The rim is carved with scrolls depicting birds. animals flowers and leaves. Chaitya windows are present in line with the thick spokes with similar windows at the bottom. The sides of the windows have dancers or mouth of crocodiles from which elaborate scroll work begins. In the centre of the thick spokes are circular medallions on which there are depictions of incarnations of Vishnu, kanyas etc. The hub of the wheel is decorated with lotus petals and in the wheels towards north dancers are depicted. The axle of the wheels are depicted with gajalakhsmi and few avatars of Vishnu etc. the wheels make a chariot of the temple and they can also be understood as the number of fortnights in one year. The deul and the Jagamohana stand on a pitha or a platform. The top of the pitha is joined with steps facing the main doors of the Jagamohana on east, north and south. They both represent a ratha, the chariot of the sun God pulled by seven horses. In front of the Jagamohana on the sided of eastern staircase horses are carved. The different elements include the pabhanga, jangha, bandhana, baranda,potala,khandi,amla beki, ghanta, arnalaka, kalasa and anartha,gavaksa, kanika etc. The Nata-mandira is a few metres away from the eastern entrance of the Jagamohana. It was used for dancing and discourses. Overall the Sun temple had a variety of scultptural detail including dancers alasa kanyas, decorative pillars, chaitya windows motifs , amorous couples, rider and foot soldiers, representations of canopies, umbrellas, shields etc. elephants, musicians, gaja simhas, image of surya, varaha, naga and nagakanya figures, dancing scenes, lady with mirror, warriors, fighting scenes are also depicted. Konarak : the heritage of mankind in two volumes by K. S. Behera,Aryan Books International,1996. Konark : monumental legacy by Thomas Donaldson,Oxford University Press,2003. This entry was posted in art history of India, asian art, konark, sculpture of india and tagged art history, sculpture on May 28, 2016 by historyreads. The Kakatiyas ruled over Telugu country or Andhradesa for two centuries . Warangal or Orugollu meaning ‘one stone’ was their capital. They ruled between 11th and 14th centuries,1052 to 1323 A. D. They built a fort, temples and created amazing sculptures.The early Kakatiyas worshipped Goddess Kakati or Kakatamma. Early records indicate that Venna was the founder of the Kakatiya rule. They initially served as feudal chiefs of the Rastrakutas. Venna was succeeded by Gunda I. The others who followed include Gunda II, Gunda III, Gunda IV. By the end of the 10th century A.D. the Kakatiyas became vassals under the Chalukyas of Kalyani; Beta I, Prola I, Beta II, Duggaraja and Prola II. Prola II asserted independence who was succeeded by Prataparudra I or Rudradeva. Mahadeva, his son ruled for a very short time after that (1198-99).His son was Ganapati deva Maharaja who was one of the greatest Kakatiya kings. He was succeeded by his daughter Rudramadevi who died in battle. She was succeeded by Prataparudradeva (1289 -1323), the last ruler who died when captured and being taken to Delhi in 1323. A.D. The Warangal fort with its impressive thoranas and two walls was mainly built during the reign of King Ganapati deva who wanted to build a cosmic pattern fortress. It was completed by his daughter Rani Rudramadevi in 1261 A.D. The fort had 45 towers and pillars, probably a third wall spread over a radius of 19 km. The remains of the swayambhu temple are at the centre with four pathways leading to it with lofty gateways or thoranams called keerthithoranams which are still visible today. The architecture has evolved from the later Chalukyan style but are representative of Kakatiya architecture. The other famous temples at Hanamkonda and Palampet at a distance of 12 and 65 kilometres respectively are the Veyi Stambha gudi( 1000 pillared temple) and Ramappa temple. The thoranams were an important part of the temple architecture of the Kakatiyas which lend the enclosed temple additional grandeur. The plan of any temple depends on its spatial arrangement. The keerthi toranas are present at four cardinal points of the temple. These thoranas resemble the ones at Aihole, Karnataka. The thorana is large, massive and has double pillars on each side and the extreme ends of the lintels are decorated with hamsas with makaras at the centre. Overall the thorana is highly decorated structure with flower designs and geometric motifs and is very imposing to the onlooker gazing upon it. A workshop maintained by the kings existed in Warangal which employed sculptors and temple builders bought their work. All over Telangana their work can be found in ceilings, pillars, doorjambs, friezes and lintels. Kakatiya architecture has other pillars termed nandisthamba, nagastambha, garudasthamba and dipastambha. The great Syayambhu temple located in the centre has elephants, horses, hamsas and gajavalas on its adisthana (on which the temple stands). Honeysuckle motifs adorn the padmajagati and kapota layers which are components of the Kakatiyan temple namely upapitha, adhisthana,padmavarga and vimana. The circular fort has an outer earthen wall and an inner masonry wall. The four gateways are at the four cardinal points. The swayambhu gudi, a temple of Siva has been partly repaired has a closed mandapa and open porch in front of which lie a group of broken images, three nandis and several lingas including a chaturmukhalinga. Portions of old pillars containing inscriptions lie in front of the temple.The fort complex has the temple Medrayanigudi, in which sixteen columns support the roof of the mandapa. Virabhadragudi contains two large dwarapalas and a beautifully carved nandi. Visnugudi too has an open pillared mandapa with dwarapalas. Venkatesagudi has a pillared hall and before the mandapa has a shaft of a richly carved shrine and ante-chamber. Nalasambugudi lies in the south of the fort. Near the south gate is Mulasambugudi. Towards west gate is the Erlalgudi with an open pillared hall. The north west of the fort had Tellagudi. The fort complex seems to be built in stages, the eastern structure was built by Ganapatideva, the western mandapa and the thoranams seem to have been built by Rani Rudramadevi. Four main toranas are monolithic and built from grey granite. The entire fort area is full of beautiful architectural pieces with rich carvings and made of black basalt, red stone and grey granite. Some of them are : a thick slab with lions, frieze with a row of elephants, pillars with dancing figures, door jamb with female dwarapalas, doorjamb with jali window,red triangular stone with large simhalata and figures in fighting postures,stone pillar with ornately carved human figures,roof slabs in red stone, lintel which may be one of the central pillars of a rangamandapa, seal with a frieze of swans etc. Some of the important motifs of Kakatiya art are gaja kesari,kirtimukha ,hamsa,alasa-kanya and kolata motifs. The art and architecture of the Kakatiyas by B. Satyanarayana Singh, Bharatiya Kala Prakashan, 1999. Temples of Telingana by M. Radhakrishna Sarma, Munshiram Manoharlal, New Delhi,1972. The Kakatiyas by Dr. P. V. Parabrahma Sastry, Government of Andhra Pradesh, 1978. This entry was posted in Deccan history, kakatiya, Keertithoranam, Warangal and tagged Ancient Indian history, kakatiya, Keerthitoranam, sculpture, Warangal on May 27, 2016 by historyreads. Art is an expression of the human spirit and depicts both sensory and abstract feelings. Art and religion are frequently inter-woven by time, experience and content. Religion finds artistic expression in sculpture,painting and architecture. in India, religion underlies many aspects of human life. Religious worship is an activity to appease powers beyond human control. It is a surrender to existence and a contemplation of the divine, from which arises peace and trust. Indian art borrows heavily from religion and through visual form many aspects of the Indian deities like Shiva, Vishnu,Brahma,Buddha, Mahavira have been depicted. Art in India exists from prehistoric times to the present day. It can be found manifest on temples, stupas, chaityas, viharas,sculpture,metal icons, paintings,terracottas,wall paintings,pottery,textiles and jewellery. Representation of deities in art is done in interesting ways. symbols and their language has been used for decoration but can also depict the divine. Symbols are used to represent nature, deities and to communicate ideas. Symbols can be used to convey abstractness and myths. An excellent symbolic representation can be seen in the famous fort of Gwalior in Madhya Pradesh. The fort at Gwalior has a long history. It stands at 300 feet above the plain lands on Gopachal Hill; it is believed to have been King Suraj Sen of the Kacchhappa dynasty who was cured of leprosy by being directed to a pond by Sage Gwalip after whom the town is named. The King enlarged the water body for common benefit. Gwalior fort is a solid structure, massive, spectacular and very impressive. The fort consists of Badal Mahal, Jehangir Mahal, many gates,water sources including Surajkund, Jauhar taal, Mansarovar,Rani Taal, and Cheri taal. A gurudwara has also been built where the 6th Sikh guru Hargovind used to meditate. Man Mandir is however the most awesome in the entire fort of Gwalior. Emperor Babur visited this palace in 1528. The entrance to the palace is Hathi por, made of four pillars supporting a dome. Two towers flank the entrance mounted by domes. The Man Mandir is the palace of the king which also housed the attendants. The Maharaja of Gwalior entering his palace,1887. Inside the palace are courtyards in square shape. To the west of the first is a dance and music hall. On the east is a living room which opens to the inner courtyard. This is large and to its east and west are the rooms for royalty. From the courtyards staircases go downwards to lower rooms. This palace has beautiful pillars,screen work, ornate ceilings, inlay work,coloured tiles and brackets. The pillars in the first courtyard are placed in four tiers divided into four segments from base to the abacus. The inner courtyard is the larger one and two panels of false screen work exist on the northern and southern side. The false screenwork/panel in the shape of a chakra is very symbolic and representative from a Hindu point of view of the cosmos. These panels on either sides of the pillars are very interesting and the Hindu trinity of Brahma, Vishnu and Shiva is represented here. At the centre of the chakra is a lotus which is a symbol of the Brahma, the creator. The lotus also suggests expansion of the soul,rooted in infinite reality and represents concept of primordial birth from the cosmic waters of creation. As per Hindu philosophy the universe or cosmos is always in flux, constantly changing. it is created, maintained and destroyed and created again. The chakra motif which is used can also be understood to refer to the cycles of time. Vishnu who is also called Padmanabha is believed to rest on the eternal ocean and out of his navel comes out Lord Brahma who takes up creation. It is said that Shiva takes up the duty of destruction at the end of eras or epochs. in this panel Vishnu is seen as a symbol resembling the Srivatsa present in concentric circles in spaces between the lattice surrounding the lotus. Srivatsa is a symbol on the chest of the Vishnu believed to have been created by the blow of Shiva’s trident (trishul) or by the wet hand of sage Bharadwaja. This symbol has been seen in caves, cave inscriptions, stupas,terracottas, seals, pottery and coins. Srivatsa is thus an auspicious mark which also occurs on the chest of Jain Tirthankaras. It has been used as a decorative element from Sunga period. In this panel the trident is represented in four concentric circles in triangular shapes to represent Shiva.They are found in circles after the Srivatsa shapes as ejecting triangles. This design with cosmic annotations thus captures the paradigm of the universe. Cosmic reality thus portrayed in Hinduism with the Trimurti principle gets depicted and by looking and meditating on this, one can sense a oneness with self and creation! Gwalior Fort : art, culture and history, Kalyan Kumar Chakravarty, 1984,New Delhi: Arnold Heinemann. History of the fortress of Gwalior,Srimant Balwantrao Scindia,1891, Byculla: Education Society Press. The dance of Shiva, Ananda Coomaraswamy, 1924 New York: Sunwise Torn-Inc. This entry was posted in art history of India, Forts, Gwalior, history of india and tagged Forts, Gwalior on May 25, 2016 by historyreads.